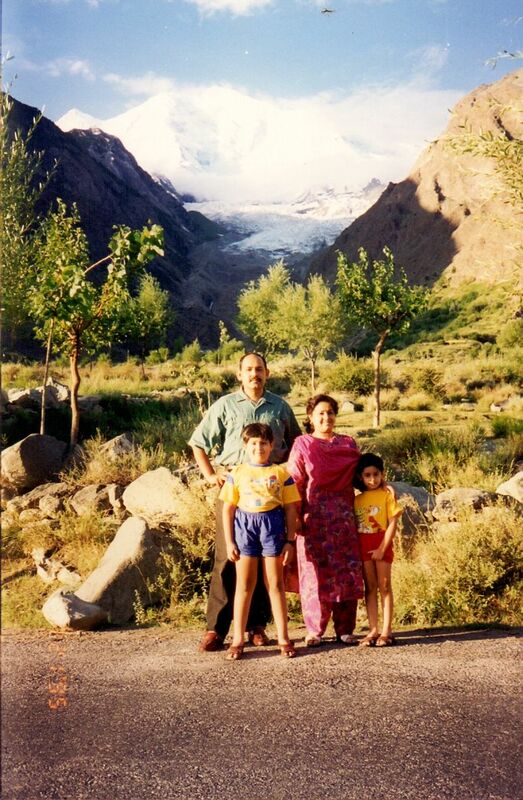 Today, while sifting through my old photographs, I came across this photo of mine posing with my wife and sons standing at the Rakaposhi Point on the Gilgit-Hunza section of the Karakorum Highway (KKH) with the mighty Rakaposhi mountain in the background. While driving to Hunza, we came across this point and were instantly frozen on the spot for it gave a full view of the Rakaposhi mountain rising from the ground level to its utmost height and glory. We stayed at the place and ordered for breakfast from a small self made eatery on the point. I still remember devouring the hot parathas (heavily greased rounded bread typical to Pakistani cuisines) and fried eggs, followed by hot fuming doodh patti (doodh=milk, patti=tea leaves, a tea made from milk and tea leaves with no water and a heavy dose of sugar). Rakaposhi is a massive mountain, rising at a height of 7,788 m above sea level in the Karakorum mountain range. 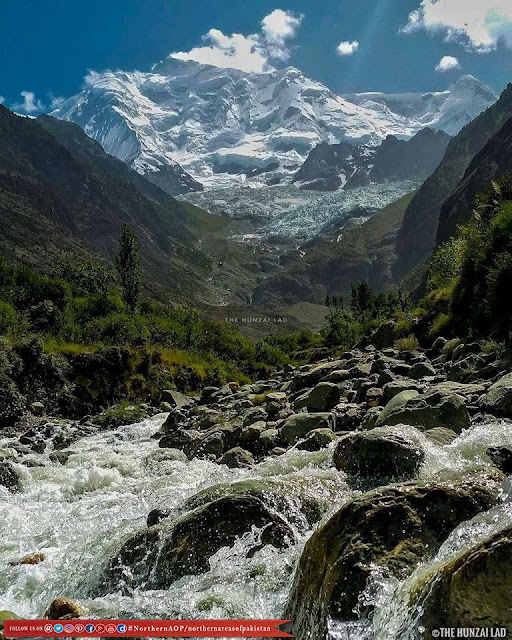 Rakaposhi, meaning the snow covered in local language, is situated in the middle of Nagar Valley Nagar District and Danyore and Bagrote valley approximately 100 km north of the capital city Gilgit of the semi autonomous Gilgit-Baltistan region of Northern Pakistan. Although, i is ranked 27th highest in the world and 12th highest in Pakistan, it is its beauty that makes it as one of the popular sites for mountaineers around the world. Rakaposhi is also the only mountain in the world which rises straight from beautifully cultivated fields to the height of 25,550 feet. The first successful recorded ascent by non-natives was in 1958 by Mike Banks and Tom Patey, members of a British-Pakistani expedition, via the Southwest Spur route. Rakaposhi is famous for its exceptional rise and it rises 5,900 m in just a little over eleven kilometers from the Hunza River. The areas around Rakaposhi are home to some of the endangered species like the Marco Polo sheep, snow lapboard, brown bear and wolves.